We’re less than 3 weeks away from the big day! If you haven’t yet registered to participate, head on over to PineRiverInstitute.com – early bird rates end May 13th. There are many ways to participate in the TREAD 6 Hour Trail Run Relay for Pine River on May 27th, 2012. It will be a great event for families, kids, competitive runners, first-time joggers, and leisurely meander-ers alike! The 4km trail will be open from 10 am until 4 pm – during this time you and your teammates can complete as many (or as few) laps of the course as you want. 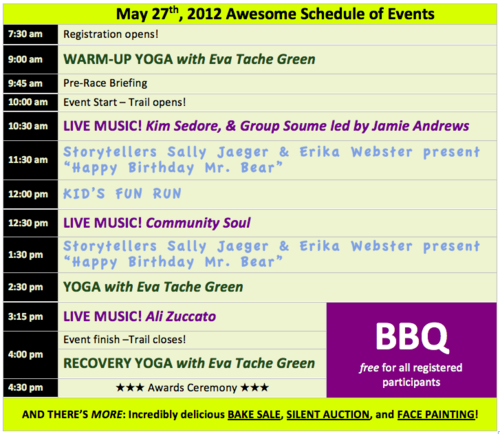 When you’re not on the trail you can enjoy live music, kids activities, yoga, storytelling, delicious food, and more!